By Dale Johnson Posted: August 25, 2016 11:30 a.m. The Owl is getting a new look. The popular campus bar will be a bit brighter and quieter – and some familiar things are being moved around. “This includes paint, new flooring on the stage and games room area, new tables and upgrades to the audio-visual system. New window coverings and acoustic panels are being installed with the intent of reducing the amount of noise that tends to emanate into the neighbourhood from time to time,” says Carl Flis, general manager of the University of Regina Students’ Union, which owns and operates the Owl. 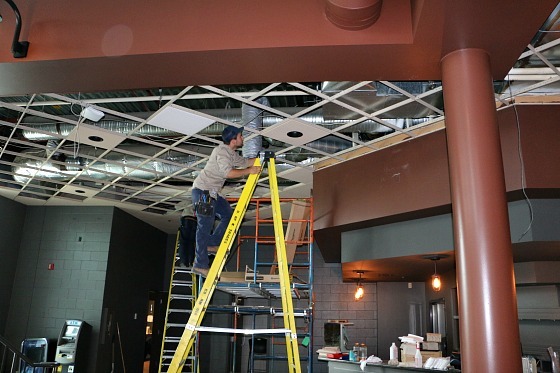 “The ceiling tile was replaced to address acoustics issues, and also to lighten the space. The size of the stage was revised, which provides more of a designated pool table area, along with some new furniture,” explains Wayne Nahnybida, an architectural designer with Facilities Management at the U of R.
As well as a refreshed look, there are upgrades to the heating and ventilation system, and the electrical system. Flis says it was time for some changes at the Owl, in order to keep up with shifting consumer tastes. And it’s not just the Owl (the place) that’s being updated; so is the Owl (the logo). “Like the space itself, the brand needed a new look also,” Nahnybida says. “We need a re-brand to better reflect our new focus and service offerings. The previous logo was stylishly outdated and created without a lot of thought behind the design. Besides a new logo and font styles, various new tag lines are being developed. This new re-brand will extend well past just signage, but be reflected in all future menus, apparel, and marketing campaigns,” Flis says. The work, which began in July, is expected to be completed in time for classes this fall. Flis expects the new Owl will attract more customers – beyond the traditional campus base. In the years ahead, there may be more changes to the Owl. There are plans for a second phase, which will include renovations to the washrooms, new seating and a revamp of the mezzanine level to create a casual lounge area. The third phase will be a relocation of the bar to create a three-sided bar backed by a multi-screen AV wall. It’s hoped all this will be done by the summer of 2018. But first things first - so be watching for phase one of the new Owl in the days ahead. “We look forward not only to the Owl's new look, but to its re-imagined focus of becoming a prominent full-service dining and entertainment venue in south Regina that is ‘campus-inspired, community- endorsed.’ All of the renovations, re-branding and operational redesign will provide customers from all sectors a memorable experience, and also permit the Owl to have the flexibility to remain a multipurpose venue permitting it to hosts a wide variety of events such as live entertainment, trivia nights, special events, smaller private events, fundraisers and expand on our catering capabilities,” says Flis.